Braun Watch Black Rubber Mens Watch BN0095BKSLBKG. 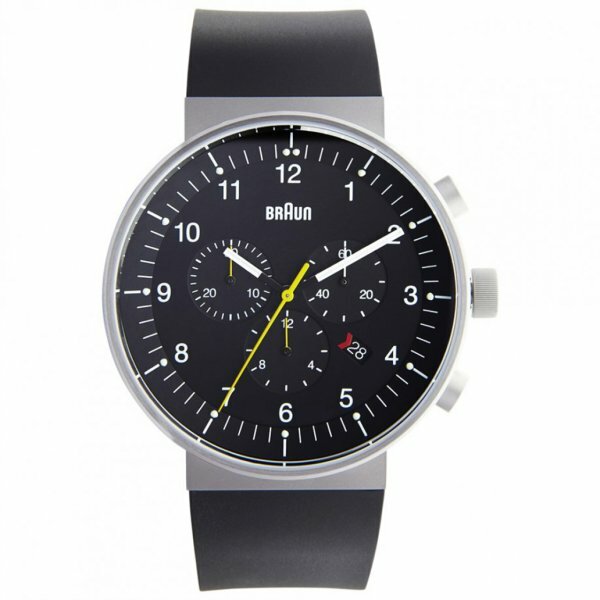 This German made Braun watch is part of the men’s Braun Time Collection. The men’s Braun BN0095BKSLBKG watch features a desirable black rubber strap, which is very comfortable and light on the wrist. Other features include Swiss movement, analogue display, chronograph function, stainless silver case, sapphire crystal and 5 ATM water resistance. The gents BN0095BKSLBKG designer watches case is carved from one single block of steel, and features no case back. By eliminating the case back, Braun has added superior protection against potential water leakage. Tic Watches are official stockist’s of Braun Watches so the stainless steel black gents Braun Watch BN0095BKSLBKG comes with 2 year manufacturer’s warranty.